What could I buy for a dastardly Shadow Lord? A Disney inspired shining sword? I think he'd like it. It comes with a banana-split. Plus a picture of a Norwegian fjord. Yeah. One devised by the secretive creative team of Writer: Peter Milligan; Artist: Will Conrad; and Publisher: DC Comics in January 2013. Is the Projectionist correct when she says that Midnighter is a part of Adam One's nefarious scheme? Implying that his love for Apollo was a ruse to aide this dastardly ploy? Is Midnighters rebuttal mealy a feint? Is the new 'Shadow Lord' actually Adam One in disguise? Can the Midnighter clear his name by suddenly kidnapping the Projectionist, and then forcing her to take him to where she alleged Adam One died? 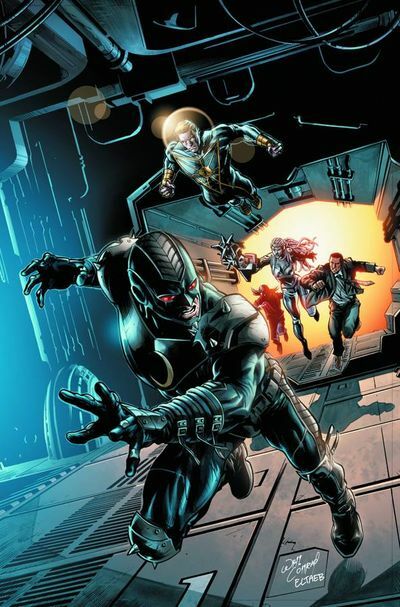 And finally, will Stormwatch comply with the 'Shadow Lord's' next new directive -- 'Kill Midnighter'? - 'Something doesn't read right. The Shadow Lords movements and gestures'. - 'The slight dip in his left shoulder. Like the feint of a boxer... or... a swordsman'. See? This dialogue is too relevant to the overall plot to just blurt-out willy-nilly. If it was in 'caption form', I think it would have been less hooey in tone. OK, I know this may sound stupid, but even though I know Midnighter isn't guilty of his crimes, there was a part of the story where I actually forgotten about this fact. Yeah. No messing about. The Projectionist's quizzing was so convincing, I started to doubt what I previously read. Good on you Peter Milligan. You mad wizard you. There were two things in this issue that I wasn't too keen on myself. Firstly, why does Stormwatch believe everything the new 'Shadow Lord' is telling them? I know he's supposed to be their boss. But that does not necessarily mean they can't think for themselves. And secondly, why has the Engineer gone 'menopausal' all of a sudden? I also know shes feeling hurt my Adam One's betrayal and that bug thing she has. But she's not lost all reasoning by default, has she? STORY: Although it didn't really go anywhere within the confines of this particular tale, I still got a bit of a creative buzz when the Shadow Lord ordered Stormwatch to kill the Justice League. Well, it's not something you read in a title everyday, is it? Moreover, I thought his rationale had some merit too -- 'power corrupts'. Oh, the irony! ART: Please tell me Will Conrad is staying on this book. Please say that DC have tied him down to a chair and is forcing him to draw from here on in. And please tell me his hands are made out of some sort of cybernetic material, which will never suffer from fatigue or oily rivets. If not -- just agree with me when I say he's a great artist -- and I'm happy that he's joined us on this stormy book. MIDNIGHTER: Yep. I'm still sticking to my plant-based casting-theme, dear reader. 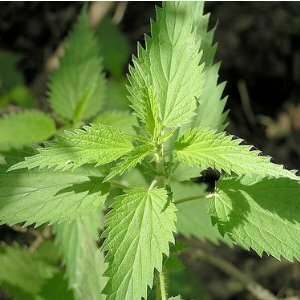 And that is why I have selected 'stinging nettles' to be this bad-boy's horticultural equivalent. They're both sharp to the touch, yet can be used to cure ailments as well. PROJECTIONIST: Without a shadow of a doubt, this belligerent blond stooge would have to be the 'ivy' of the plant kingdom. They're both nice to look at. Misguided during growth. And difficult to prune in cold weather. What's Worse Than Betrayal? Love Or Death? No One Decides. Now I don't want to choose Clint Eastwood's 'The Gauntlet' to represent this comic book adventure, as I chosen this film many times in the past. But because it's such a good match -- with the 'boss' playing his 'subordinate' like a sap, directly prompting a chase to ensue -- I have to no choice, do I? Life stinks at times, doesn't it? Day in, day out, some schmuck is dishing out crap as if it were going out of fashion, and its poor saps like us who have to mop it up afterwards. You -- literarily. However, please take heed of my words, my friendly Hygiene Technician. Some day we will be the schmuck. We will be grabbing God knows what and then throwing it at some poor sap for no reason what so ever. Take the guys on this book for example. I remember when Peter Milligan was a bus conductor on a barren island. And let's not forget Will Conrad and his... err... nightly pursuits in Bangkok, either. Still, look where they are now. On the top of their game. Strutting their stuff in their own amiable way. Dishing out joy in the boat load to all in sundry. We'll be there one day, pal. You'll see. Sharing the spirits of Milligan and Conrad.